Historic Bayfield is located on the shores of Lake Superior. 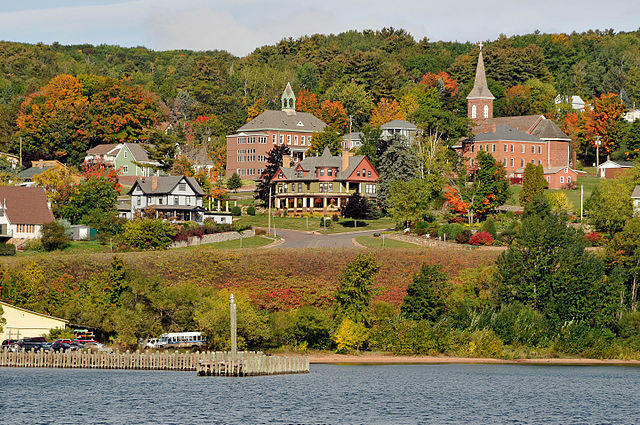 Bayfield, Wisconsin, (population 547) is located at the northernmost tip of the state, on Lake Superior. It was founded on March 24, 1856, one of several communities established after the Treaty of LaPointe between the United States and the Ojibwe (Chippewa) Native American peoples in 1854. Bayfield quickly became the major shipping port in the Chequamegon Bay area, and its brownstone quarries began supplying stone for buildings throughout the Midwest and New York. Bayfield’s timber industry also thrived, and the town experienced great prosperity from 1880 to 1910, when its most prized homes and buildings were constructed. Bayfield’s economic fortunes declined as brownstone quarrying disappeared, the victim of a change in architectural styles, the use of steel building materials, and competitive price-slashing. The lumber industry died in 1927 when the last mills were closed, and only remnants of Bayfield’s once-large commercial fishing activities remain today. Tourism has become the major source of local economic activity. A 50-block area of Bayfield is a National Register of Historic Places-listed Historic District. The district includes 52 buildings of special historical and architectural significance, including excellent examples of the Queen Anne style and elaborate decorative work. A booklet takes visitors on a self-guided walking tour past historic homes, churches, and public buildings. Visitors on foot can also take the Iron Bridge Historic Nature Trail to the former dam site of the Bayfield Waterworks and view interpretive signs about Bayfield’s pioneer days. The Bayfield Heritage Association offers interpretive exhibits, tours, educational programming, and seminars in its center. The association purchased and renovated the Old Bayfield County Courthouse, built in 1884 of local brownstone, which is now used by the National Park Service as the headquarters for the Apostle Islands National Lakeshore. A more recent project recreated an old-time barbershop, complete with original furniture, bottles, signage, clock, and even matchbooks.